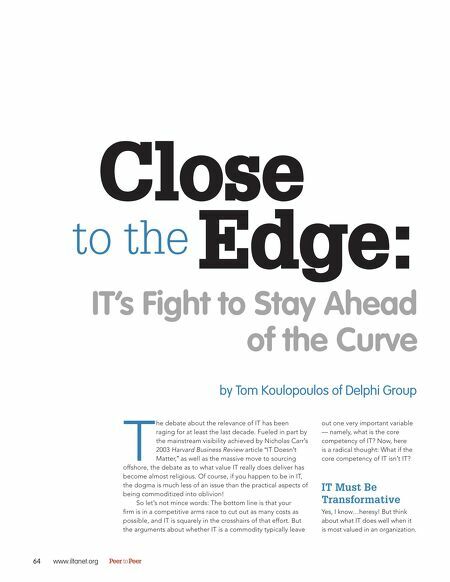 to theEdge: Close IT’s Fight to Stay Ahead of the Curve by Tom Koulopoulos of Delphi Group offshore, the debate as to what value IT really does deliver has become almost religious. Of course, if you happen to be in IT, the dogma is much less of an issue than the practical aspects of being commoditized into oblivion! So let’s not mince words: The bottom line is that your firm is in a competitive arms race to cut out as many costs as possible, and IT is squarely in the crosshairs of that effort. But the arguments about whether IT is a commodity typically leave T 64 www.iltanet.org Peer to Peer he debate about the relevance of IT has been raging for at least the last decade. Fueled in part by the mainstream visibility achieved by Nicholas Carr’s 2003 Harvard Business Review article “IT Doesn’t Matter,” as well as the massive move to sourcing out one very important variable — namely, what is the core competency of IT? 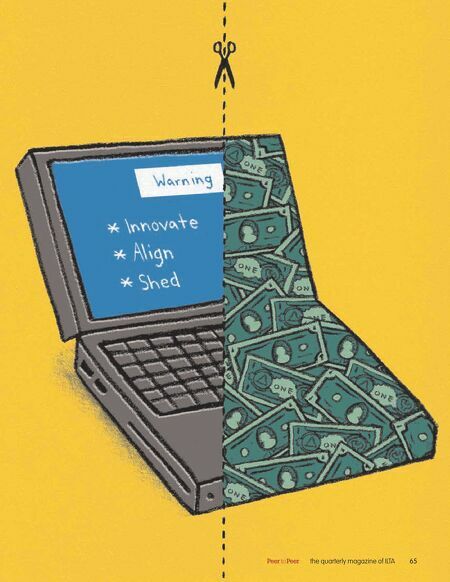 Now, here is a radical thought: What if the core competency of IT isn’t IT? IT Must Be Transformative Yes, I know…heresy! But think about what IT does well when it is most valued in an organization. Your Podcar Awaits at ILTA 2020?